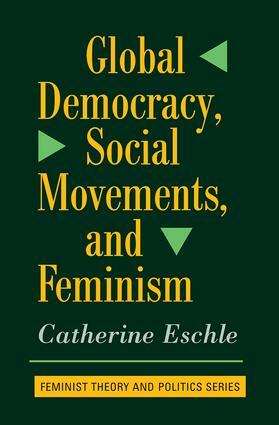 In Global Democracy, Social Movements, and Feminism Catherine Eschle examines the relationship between social movements and democracy in social and political thought in the context of debates about the exclusions and mobilizations generated by gender hierarchies and the impact of globalization. Eschle considers a range of approaches in social and political thought, from long-standing liberal, republican, Marxist and anarchist traditions, through post-Marxist and post-modernist innovations and recent efforts to theorize democracy and social movements at a global level. The author turns to feminist theory and movement practices--and particularly to black and third world feminist interventions--in debates about the democratization of feminism itself. Eschle discusses the ways in which such debates are increasingly played out on a global scale as feminists grapple with the implication of globalization for movement organization. The author then concludes with a discussion of the relevance of these feminist debates for the theorization of democracy more generally in an era of global transformation.